"Ballyhoo is still with us, and always will be." Showbiz Ballyhoo borrows the old carnival term to cover the early history of Hollywood movie marketing, hosted by David Steinberg. This television documentary features vintage public service announcements, screentests, newsreels and other sales-oriented material, with appearances from many silver screen stars of the 1920s, 1930s and 1940s. The main attraction here is the program's collection of rarely-seen footage—it's interesting to see Shirley Temple advertising the Red Cross, Mary Pickford talking with her husband-to-be Charles 'Buddy' Rogers, and Darryl Zanuck overseeing Sonja Henie's contract signing. Edgar Bergen's Charlie McCarthy turns up in blackface minstrel makeup, Cecil B. DeMille directs, and MGM enlists Wallace Beery and Marie Dressler to propagandize against Daylight Savings Time (which the studio feared would reduce cinema attendance). Many recognizable personalities turn up in "candid" moments at movie openings and such, and most viewers will make a few new discoveries during the disc's 75-minute run. The program's framework is less successful—David Steinberg seems awkward and uncomfortable as host, his eyes constantly running for the safety of the TelePrompter, and he's not given much to work with scriptwise. The show's intended focus on Hollywood salesmanship drifts a bit (a "bloopers" segment seems like needless padding) and completely ignores the four-walled roadshow adventures of the itinerant exploitation pioneers. And the chronology is suspect—few dates are given onscreen, though personalities are conveniently and clearly identified with subtitles, and a section on Hollywood's World War II efforts is followed by a piece on the introduction of sound. Die-hard movie fans will still want to check out Showbiz Ballyhoo. Just ignore the structural framework, fill in your own historical background and enjoy such novelties as Judy Garland and Mickey Rooney talking to New York's Mayor Fiorello LaGuardia, Bob Hope teasing Bing Crosby and Frank Sinatra, and Errol Flynn leading a parade. Image Transfer Review: Showbiz Ballyhoo is presented in its original made-for-television 1.33:1 full-frame aspect ratio, drawn from a broadcast videotape master at 30 frames-per-second. The vintage source material is often in poor shape, with deterioration and wear, and some early color footage suffers from smeariness and inadequate contrast in the video transfer. Detail is generally fair to poor, with ringing artifacts around superimposed titles and edge enhancement throughout; the program is certainly watchable, but its videotape origins are glaringly evident, and one wishes the film sources had been remastered for DVD. Audio Transfer Review: FOCUSFilm presents Showbiz Ballyhoo in its original monophonic audio format, digitally mastered in Dolby 2.0 for ProLogic decoding to the center speaker. The vintage film audio is understandably noisy and clipped, and the newly-created host footage suffers from some echo and limited frequency range. Dialogue in some of the older archival material is difficult to understand, and a little bit of electronic clean-up might have been appropriate here. Even given the age of the various sources, the audio here is below contemporary DVD standards. Extras Review: Documentaries generally don't call for extras, and this bare-bones disc delivers on that count, with 8 picture-menu chapter stops, nothing more. 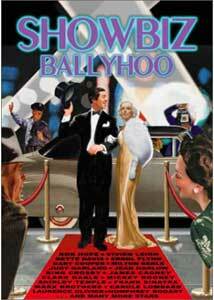 Showbiz Ballyhoo is a competent if limited documentary, featuring rare footage of the biggest stars of vintage Hollywood. FOCUSFilm's DVD transfer is competent given the videotape source; movie mavens will want to check this one out.